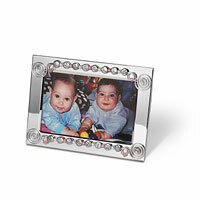 5" x 7" Nickel plate frame is personalized with one name on the top and one on the bottom. Perfect for twins or siblings! This item is usually made and shipped within 1 to 7 days of the purchase date.